Close your eyes and imagine you are a woman in Cape Verde…you will be the first to wake and the last one to go to sleep. You will be responsible for washing everyone’s clothes by hand, including extended family. You will make breakfast, lunch and dinner every day, even when you don’t feel well. And, you will not eat the meal you prepared until everyone else has had seconds. You will care for all the children, including grandchildren, nieces and nephews. You will clean the entire house, sweeping under your husband’s feet while he watches television. You will sell fruits and vegetables in the market, only to come home and take care of your family. And on top of all your duties, during the rainy season, you will work in the fields, taking care of your family’s crops. Your life is consumed by caring for others. No thank you’s, no let me help you, no days off. When you want something done here, you talk to the women. The women are constantly doing. They know their land; they know their people. 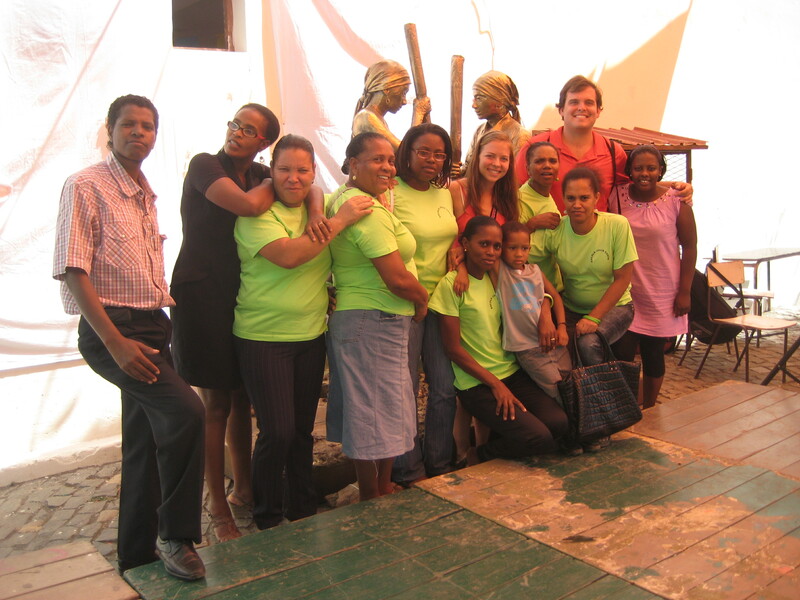 On Saturday, I attended a festa, with fellow elementary school teachers, to celebrate Cape Verde’s Women’s Day. And boy was I delightfully surprised. Women dressed up as men and openly discussed issues such as the high rate of teen pregnancy and inequality in the workplace. To top it all off, they celebrated their strength. They danced, they sang, they joined together for change. After all, women of this country led a revolt against the Portuguese in 1910 (Revolta de Rubon Manel). As much progress as I sometimes see, I still see that much digression. Sometimes I feel as if we walk one step forward and two steps backward. We discuss change; we discuss drastic disparities, yet no action is taken. For instance, on the way to the day-long festa, one of the teachers remarked that her husband made her do all the housework and cook his meals before she could leave home. She left it with a sigh and a remark about how he can be mean sometimes, but there’s so much more to it. And then I start thinking about my village. I imagine coming back twenty years from now and everything being exactly how I left it – maybe a few more wrinkles on my mother’s face, maybe a few additions to the family, but life still remains how I knew it. To end on a more positive note, here’s a video from the festa — celebrating the strength of women all over Cape Verde. Look for my elementary school principal, in the green shirt, dancing the batuk! I couldn’t agree more. Most to the point – the relation about “getting stuff done” to women in CV. In my 1.5 years here, this is something that I felt since the beginning in PST and have only had reinforced time and time again. It is a sad note, but very true in many ways. If there was something I could pass on in a phrase to incoming community development Vs it would be exactly that – “if you want to get something done, go to the women”. Men here make men look, well bad. Good post. Voce tem razao! As mulheres fazem tudo neste pais. As mulheres sao a mao dereita deste pais.